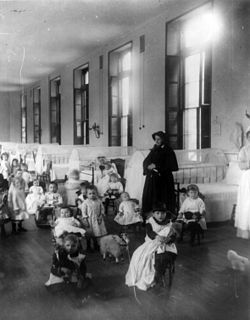 Sister Irene o New York Foundling Hospital wi bairns. Sister Irene is amang the pioneers o modren adoption, establishin a seestem tae buird oot bairns rather nor institutionalize them. Adoption is a process whaurbi a person assumes the paurentin o anither, uisually a bairn, an or ainimal frae that person's biological or legal paurent or paurents, an, in sae daein, permanently transfers aw richts an responsibilities, alang wi filiation, frae the biological paurent or paurents. Unlik gairdianship or ither seestems designed for the care o the young, adoption is intendit tae effect a permanent chynge in status an as such requires societal recogneetion, aither throu legal or releegious sanction. Historically, some societies hae enactit speceefic laws govrenin adoption; whaur ithers hae tried tae achieve adoption throu less formal means, notably via contracts that specifee'd inheritance richts an paurental responsibilities wioot an accompanyin transfer o filiation. Modren seestems o adoption, arisin in the 20t century, tend tae be govrened bi comprehensive statutes an regulations. This page wis last eeditit on 18 November 2017, at 19:54.